hi. my name is Katie and my family is both Buddhist and Christian. I grew up going to church and all but never felt too connected to it. One summer during middle school, my mom decided to send me to a Buddhist summer camp at a nearby temple. if you consider a 2.5 hr drive nearby. The camp was 3 weeks long and they served only vegetarian food. No meat for almost a month! And I love my meat. I learned many new ideas and concepts such as the circle of life in the eyes of Buddhists. Although while I was there I was being a young rebellious kid pretending not to believe Buddhism but one of my general studies class, women spirituality, made me think more about my connection with religion. I then realized I do believe and want to learn more. After learning more, I did my research and decided to have the negative karma cleansing mantra tattooed. This mantra means a lot to me and I believe is much needed for me, my family, and my friends. Since mantras work even by seeing it, I hope those who see it on me will have their negative energy purified as well. Unfortunately, being a college student means being broke and it took some time for me to save up the money and find time to do it. I am visiting Hong Kong this summer and figured I don't want to wait any longer. It is also perfect timing since I'm going to the Electric Daisy Carnival in Vegas right before I leave for Hong Kong. I called in to a local tattoo shop I found with good reviews and went in that day. I was planning on getting the mantra done but I didn't bring enough money so I actually got another tattoo first, which is my actual real tattoo. 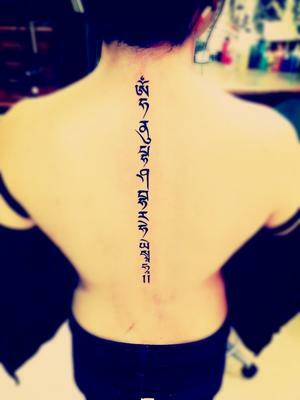 Then I went back in today and got the mantra tattooed. My friend keeps telling everyone we see, bragging for me which is hilarious. Apparently I'm more thug than them now. Well joking aside, I can't wait for it to heal up! Pretty cool I found this site just now too.